Join us for a casual fireside chat between Mitch Daniels and our host Bob Jones, Chairman Old National Bank. 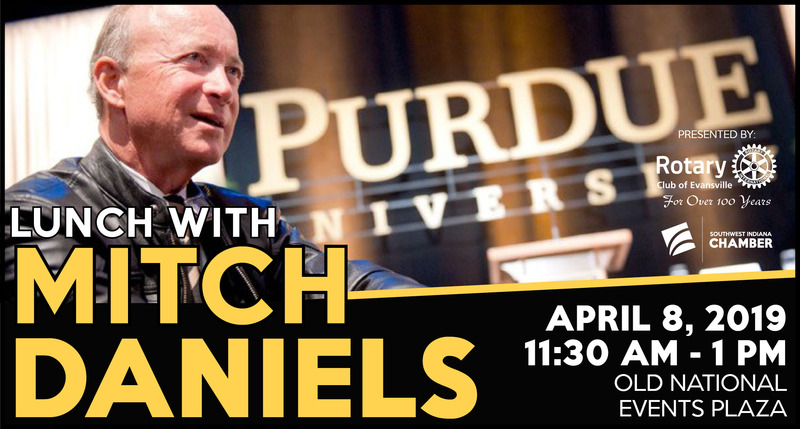 Lunch with Mitch Daniels will take place on Monday, April 8, 2019, 11:30 am - 1:00 pm at the Old National Events Plaza. Mitch Daniels Jr. is an academic administrator, businessman, author and retired politician who served as the 49th Governor of Indiana, from 2005 to 2013. Since 2013, Daniels has been president of Purdue University. Have a question for Mitch? Go to Slido.com and enter event code #askmitch! Mitchell E. Daniels, Jr. is the 12th president of Purdue University and the former governor of Indiana. He was elected Indiana’s 49th governor in 2004 in his first bid for any elected office, and then re-elected in 2008 with more votes than any governor in the state's history. During his tenure, Indiana went from bankruptcy to a AAA credit rating, led the nation in infrastructure building, and passed sweeping education and healthcare reforms. After a series of transformations, which included the biggest tax cut in state history, the nation’s most sweeping deregulation of the telecommunications industry and a host of other reforms aimed at strengthening the state’s economy, Indiana’s business climate is now rated among the nation’s best. At Purdue, Daniels has prioritized student affordability and reinvestment in the university’s strengths. Breaking with a 36-year trend, Purdue has held tuition unchanged from 2012 through at least the 2020-21 academic year. Simultaneously, room rates have remained steady, meal plan rates have fallen about 10%, and student borrowing has dropped 31% while investments in student success and STEM research have undergone unprecedented growth. It is less expensive to attend Purdue today than it was in 2012. In recognition of his leadership as both a governor and a university president, Daniels was named among the Top 50 World Leaders by Fortune Magazine in March 2015. Prior to becoming governor, Daniels served as chief of staff to Senator Richard Lugar, senior advisor to President Ronald Reagan, and Director of the Office of Management and Budget under President George W. Bush. He also was the CEO of the Hudson Institute, a major contract research organization. During an 11-year career at Eli Lilly and Company, he held a number of top executive posts including president of Eli Lilly’s North American pharmaceutical operations. Daniels earned a bachelor's degree from Princeton’s Woodrow Wilson School of Public and International Affairs and a law degree from Georgetown. He is the author of three books and a contributing columnist in the Washington Post, and his writings are regularly featured in other publications. He and his wife Cheri have four daughters and six grandchildren. Locust Street will be closed until Noon on April 8 for the Home Show move out. 9th Street and Walnut will be open along with the Civic Center parking lot.